Last week I had an appointment in Flagstaff, so we decided to take the Oak Creek Canyon scenic route. 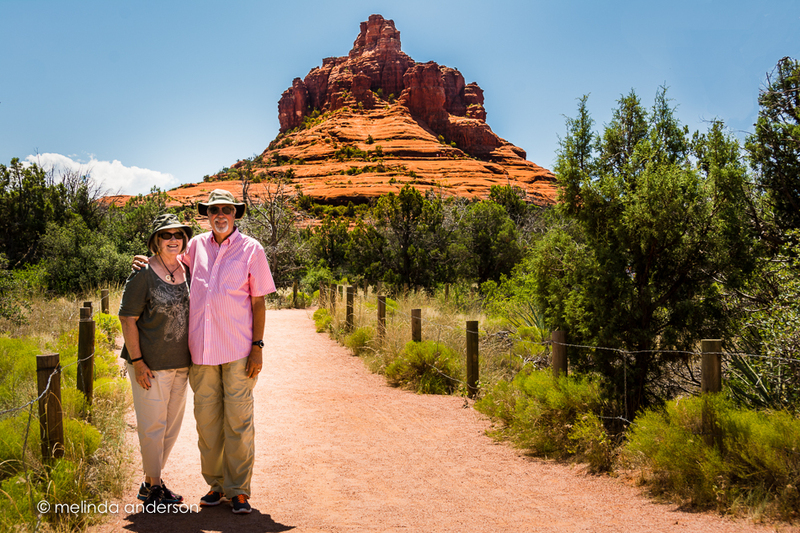 Of course, we had to stop at the Bell Rock and the Courthouse parking areas to visit some of our favorite rock formations! It had been raining, so the red in the rocks was extra saturated. But, for some reason, I converted this image of the Courthouse to black and white, which I thought made a nice contrast with the clouds. When we walked the paths at Willow Lake during our end of February snowstorm, we were amazed at how saturated the color of the rocks was in the diffused light and falling snow. Here is the view as we walked our usual path through the rocks toward the lake. Not quite Sedona- but still beautiful! 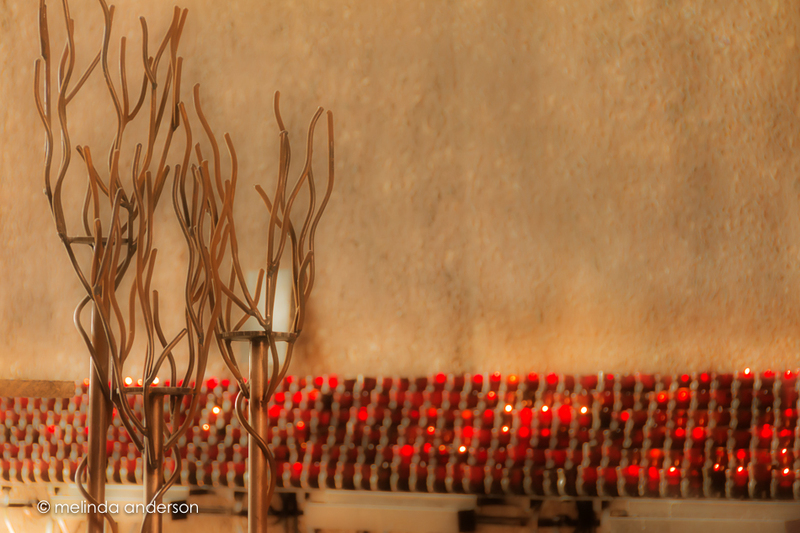 Editing photos for creative expression, relaxation, and just plain fun is an essential part of my photography life. I don’t paint or do crafts- so I create with the camera and the computer. I respect and enjoy traditional photography, but I sometimes like to tiptoe a bit onto the photography wild side. Yesterday I revisited some of last summer’s photos from Alaska. At the time, I was fascinated with the stark shapes of the rocks and peaks jutting out of the sea, but I was disappointed in many of the resulting shots when edited traditionally. But I had so much fun creating the “alternative landscapes” below. Don’t you think colour looks better than color? One of my favorite quotes is “Keep calm and fake a British accent,” so this is in that spirit (nothing to do with Brexit. . .). The above is from last week’s trip to the Grand Canyon. The hazy sky desaturated the colors, which I brought back with Lightroom’s Dehaze brush and some other adjustments. THEN I added a very slight adjustment with Topaz Glow, which is such a cool little plug-in- it does things I don’t know how to do otherwise. Very fun! The frame is from On1 Effects. On our way home from downtown on last week’s snowy day, we stopped at Watson Lake to see if the Dells were covered with snow. The sun had just started to peek through the clouds, and there was only a slight dusting of snow visible. I watched from up above as the heron waded along the shoreline- a peaceful sight. 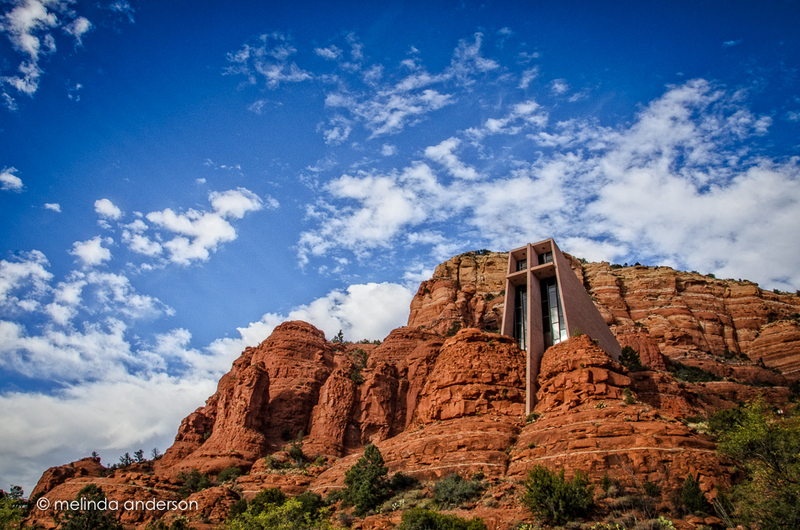 Whenever we take out of town visitors to Sedona, we always take them to Chapel of the Holy Cross. Built into the rocks with a spectacular view, it is a very special place. Despite being full of visitors, you can always sense the spiritual and sacred essence of this spot. 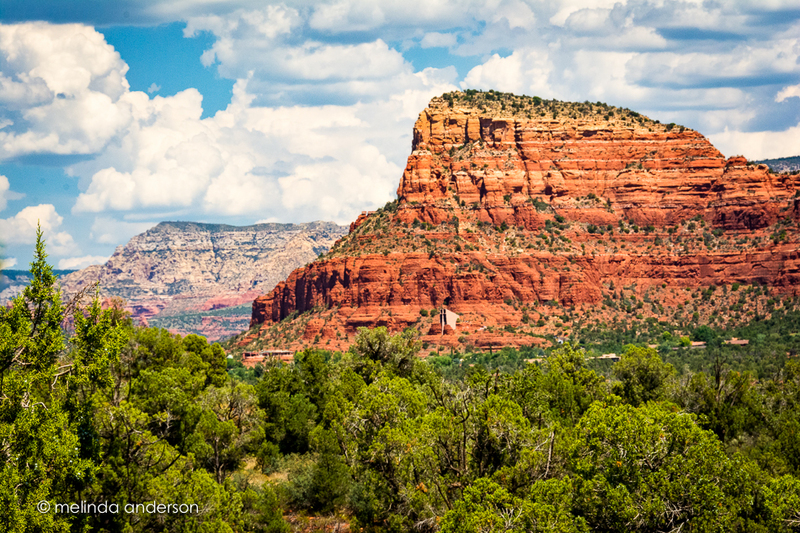 When we visited Sedona a week or so ago, I took a few photos inside with my Lensbaby Edge 80. The top photo was taken a year or so ago, and I just re-edited it in Perfect Effects (my current go-to tool for editing landscapes) for today’s blog. 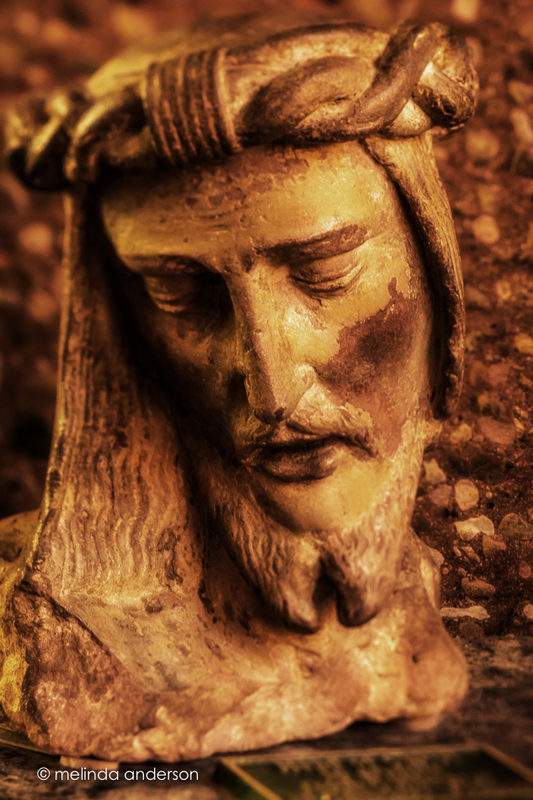 The head of Christ and the candles at the bottom were edited in Lightroom and Photoshop. 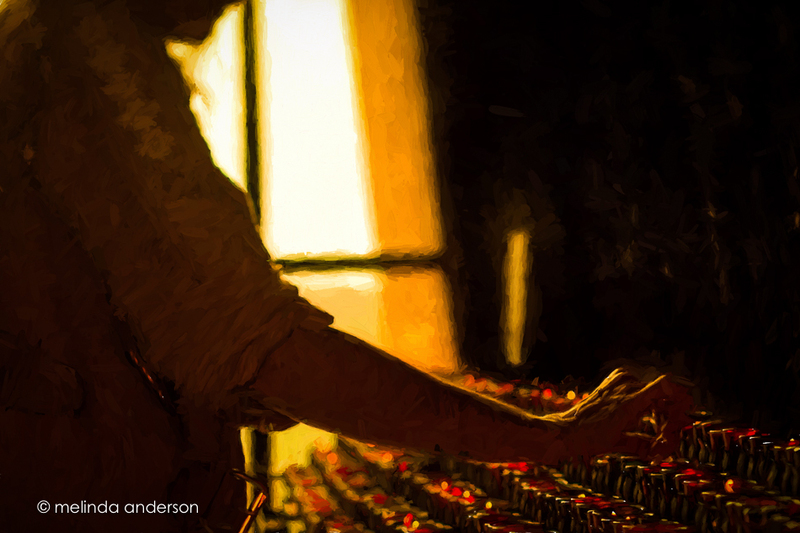 The middle photo of the person lighting a candle was edited in Topaz Impression, using the Van Gogh filter (I wish there was a way of recording that so I could remember- maybe a post-it notes feature in Lightroom!). Last weekend we had a wonderful visit with our dear friends, the Jansons, who came from California so that Carolyn could present a HeartMath workshop at our church, Unity of Prescott. It was a wonderful weekend in so many ways, with the highlight of course being Carolyn’s over-the-top inspiring presentation on Sunday. They flew home last night, and we miss them already. 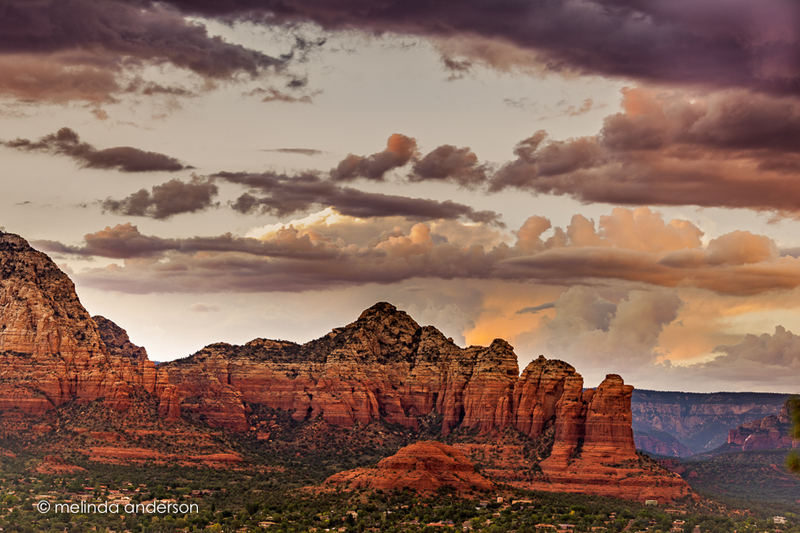 We spent the Saturday before her workshop in Sedona and Jerome, and it was the hottest day we’ve experienced in that area. Armed with sunscreen, hats, and water bottles, we took a short walk at Bell Rock until we decided it was just too hot. I did manage to take a few photos despite the heat- I never get tired of these views! In the shot below you can see the Chapel of the Holy Cross built into the rocks in the distance. And here are the Jansons! After leaving the plains of Kansas, we drove to Colorado, spending the night at Limon. 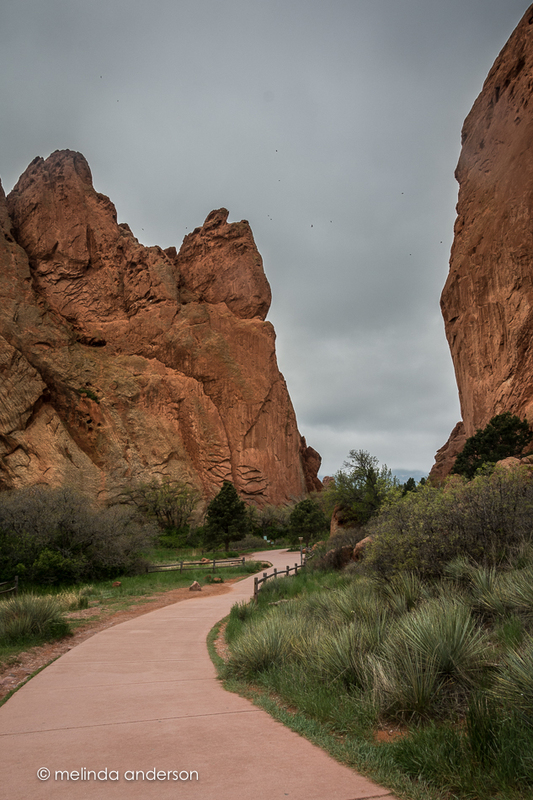 We decided to get up early-ish (early for us, late for landscape photographers) the next morning to drive to Garden of the Gods in Colorado Springs before heading to Santa Fe. We woke up to overcast skies and got to the park around 9:00 or 9:30. 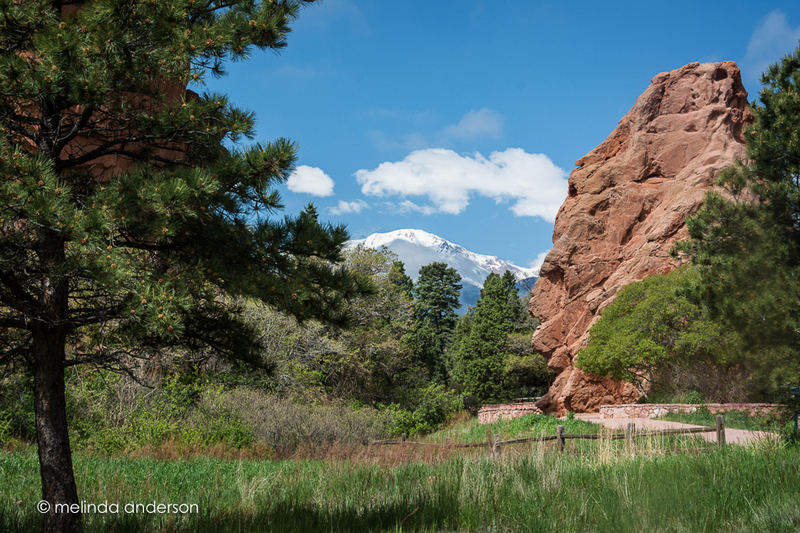 Garden of the Gods is a public park with paved walkways among gorgeous red rock formations. It was relatively uncrowded, probably because it appeared that it would rain at any moment. 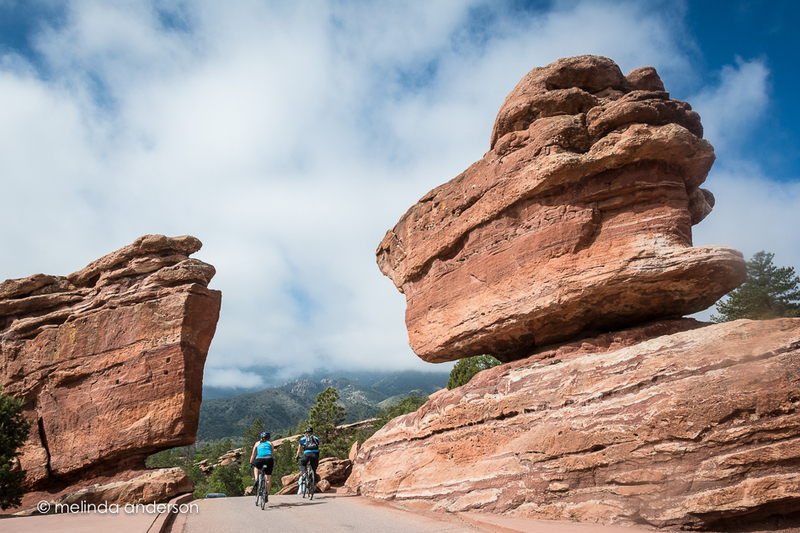 We were both eager to see the iconic view of Pike’s Peak through the red rocks, but of course, you couldn’t see the mountains because of the clouds. 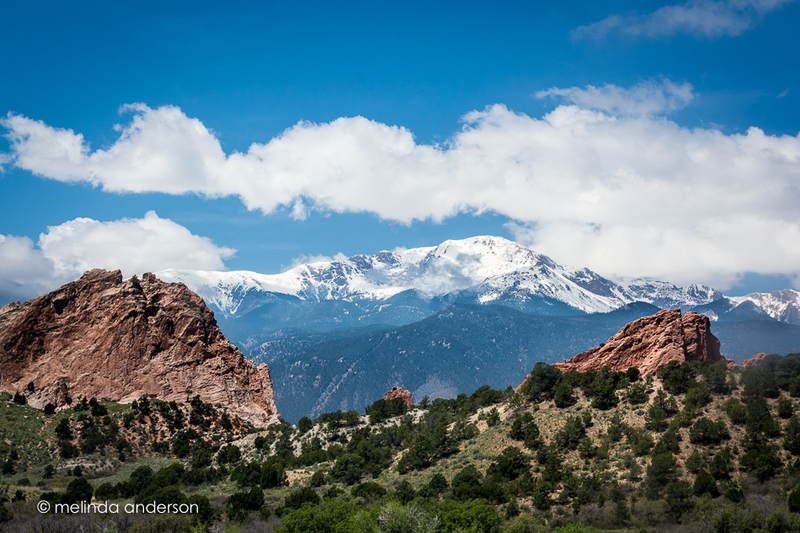 I love the combination of gray clouds and red rocks, but I was really hoping to see Pike’s Peak! After walking through the park for awhile and monitoring the skies in case we had to make a dash to the car, we finally decided a drive around the park might give us a glimpse of the mountains. 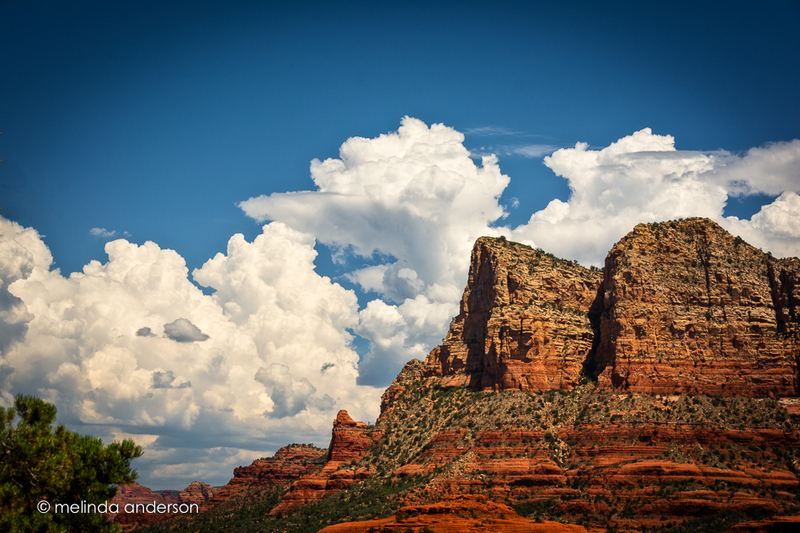 We drove around, but all we saw were clouds and red rocks- and more clouds. But as we got out of the car to look at the Balancing Rock, we noticed that the skies were beginning to clear a bit. We ate a quick snack at the Visitors Center, and then drove back into the park to see what we could see- and VOILA! The above shot is of the same rocks and walkway (from a different angle) as the first one a couple hours earlier. 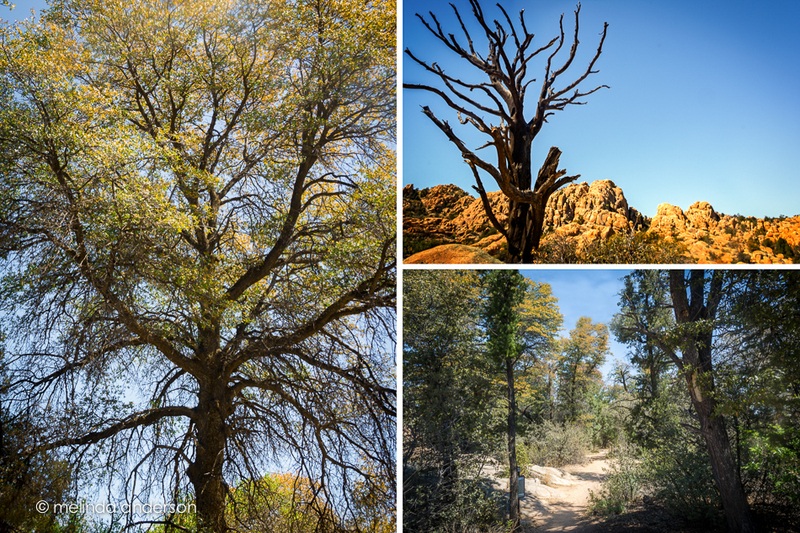 We have miles and miles of trails yet to discover here in Prescott. Saturday, we took a short walk on the Constellation Trail, which winds by the Granite Dells just outside of town. Because my husband is still in recovery mode, we stopped after a half hour, but really enjoyed the trails and scenery.